Habitat or patch occupancy models are increasingly being used to document presence/absence and relative abundance of wildlife species ranging from snow leopards or tigers to salamanders, frogs and many bird species. Establishing the absence of a species in a particular area is complicated by questions of uncertainty – is it really absent or did the observer simply fail to detect its presence (i.e., no sign was found during the field survey), when it in fact occurred in the area at the time of the survey? 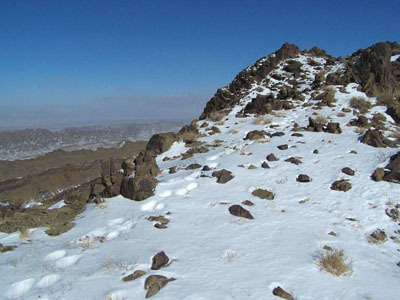 Occupancy surveys involve searches of sample areas (called grids or polygons) of designated size over a relatively short time interval (e.g., 2-5 consecutive days) to search for sign or other evidence the area is being used by snow leopards. Simply stated, the researcher tallies the proportion of sample areas or units at which snow leopards (or their sign) were detected during each visit to estimate the species’ overall detection probability and occupancy rate. When indexed to relevant habitat factors (e.g., slope steepness, landform ruggedness or prey abundance), these data can be more easily extrapolated to a wider area for deriving a relatively robust index of abundance (including the probabilities of occurrence). Occupancy modeling is well suited to detecting range expansions and contractions.